Just an FYI comment about the narrow filters NOT staying on while tuning. I read about the similar problem that you encountered during the initial testing of the PL-880. While tuning CW stations with the 500 Hz filter turned on (fast or fine tuning), the filter would always revert back to the 3.0 wider setting. It had never done this before. I tried several resets with no cure. After further testing I found the fix: I had turned on the Hidden Menu Noise Reduction (switch 6) and did not realize it was on. After turning off the Noise Reduction, I was able to tune with the narrow filters set at any band width. Evidently, the filter opens up to 3.0 when tuning with the Noise Reduction turned on & reset does not turn off this function. Thanks so much for the tip, Gary! I’ll add this to our (still) growing list of PL-880 hidden features and tips. Seems there’s always something to discover on the Tecsun PL-880. This entry was posted in How To, News, Portable Radio, Shortwave Radio and tagged PL-880, Tecsun, Tecsun PL-880, Tecsun PL-880 Hidden Feature, Tecsun PL-880 Hidden Features on February 10, 2016 by Thomas. The signal meter is supposed to measure up to 99dBu (my Tecsun PL-390 s-meter goes indeed up to 95-97dBu for very strong amateur signals in my area included mine in mw zone). The point is that for both devices (both of which have 8820 firmware) the signal meter does not exceed 85 dBu and in particular my Tecsun PL-880 signal meter does not goes over 70dBu (ie. even lower measurement). Why this behaviour? Another strange point is that my friend’s Tecsun receiver displays for a “quiet” frequency (mw) a noise level of about 10-12dBu, while my Tecsun device shows only 2-3dBu noise (same frequency in the same spot!). We both tried the threshold muting adjustment (key 9) and this worked a bit but with minor results in sensitivity, especially for my Tecsun PL-880 receiver. Is it possible to adjust the noise level so that it can be 10-12dBu instead of being only 2-3dBu and hence better sensitivity? And is it possible to adjust the maximum signal level (99dBu instead of 85dBu or even worse 70dBu for my device)? I have noticed that the hidden feature regarding the external mw antenna didn’t work in my case, even though I did resets an tried many times. I pressume, hence, that maybe Tecsun disabled this hidden feature. Is there any modification available to “add something” into the radio hardware in order to be able to listen mw/lw frequences with external antenna and thus, increase sensitivity? Many thanks for your questions, Evans. Since my PL-880 is a first production run unit, I’m hoping readers who’ve recently purchased the Tecsun PL-880 might comment. I suspect Tecsun engineers give little thought to calibrating the S meters. I’m very curious if there is a hidden feature to do this, but I’m guessing this is limited only to those who can program the DSP functionality of the chip inside. 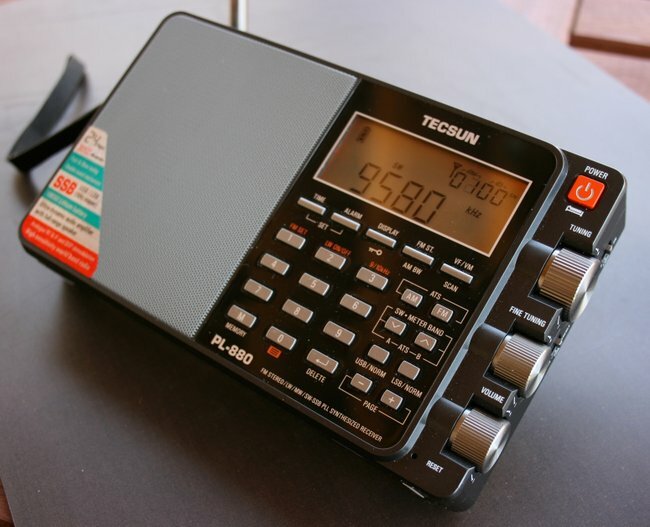 This entry was posted in Mediumwave, News, Portable Radio, Radios, Shortwave Radio and tagged PL-880, Tecsun, Tecsun PL-880, Tecsun PL-880 Hidden Features on August 25, 2015 by Thomas.